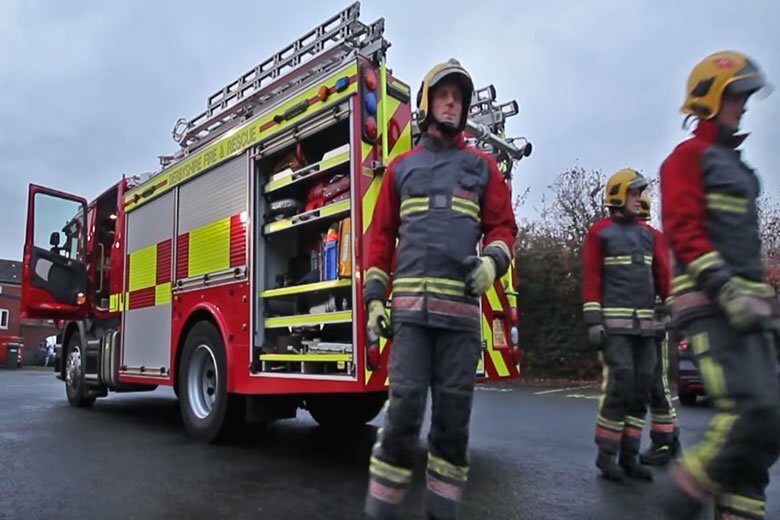 A Day in the Life of a UK Firefighter is a video produced by Derbyshire Fire & Rescue Service. Derbyshire Fire & Rescue Service provide a wide range of services, often in partnership and collaboration with others, to the people who live, work and visit the county and aim to achieve excellence in all that we do. We are available to respond to calls across Derbyshire every minute of every day and work hard to reduce the risks of fires, road traffic accidents and other emergency incidents across the county through our activities. The Service employs over 800 personnel and has a total of 31 fire stations based in strategic areas to cover the local area. Derbyshire Fire & Rescue Service covers over 1,000 square miles, which includes a variety of urban and rural communities with a population of approximately 980,000. The Service currently employs approximately 360 wholetime firefighters, 331 retained duty system firefighters, 27 Command and Control personnel and 176 support personnel. The Services operates and maintains 31 fire stations, four area offices and the Services headquarters in Ripley, Derby. The Services governing body is the Derbyshire Fire & Rescue Authority which provides strategic leadership, monitors the costs incurred by the service and sets the budget.